$80 per person or $800 for a table of 10. 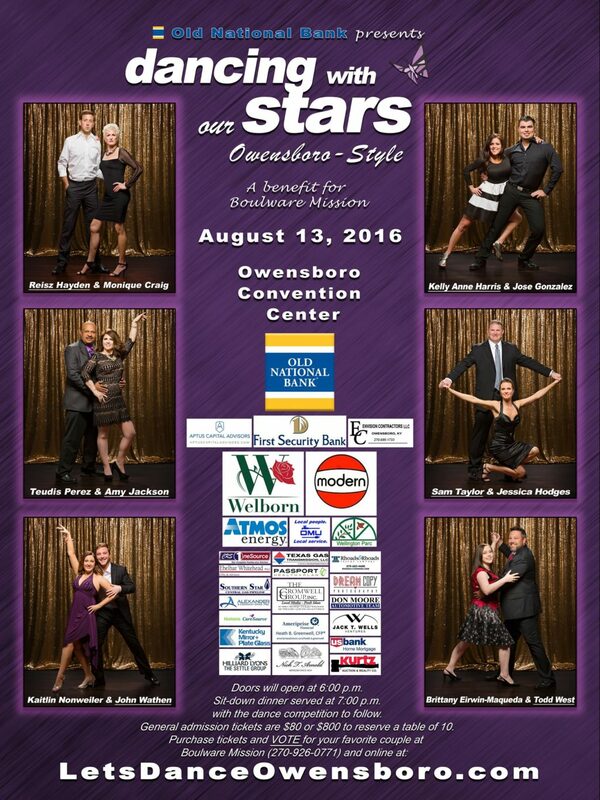 Old National Bank presents the 4th Annual Dancing With Our Stars Owensboro Style to benefit Boulware Mission! Six local celebrities will partner with local dancers to perform one routine in competition for the mirror-ball trophy. Evening includes sit-down dinner, competition, and open dancing. 2016 couples are: Kelly Anne Harris & Jose Gonzalez, Reisz Hayden & Monique Craig, Amy Jackson & Justice Little, Sam Taylor & Jessica Hodges, John Wathen & Kaitlin Nonweiler, and Todd West & Brittany Eirwin-Maqueda. Visit www.LetsDanceOwensboro.com to vote for your favorite couple or purchase tickets.